This is my first wee nephew! 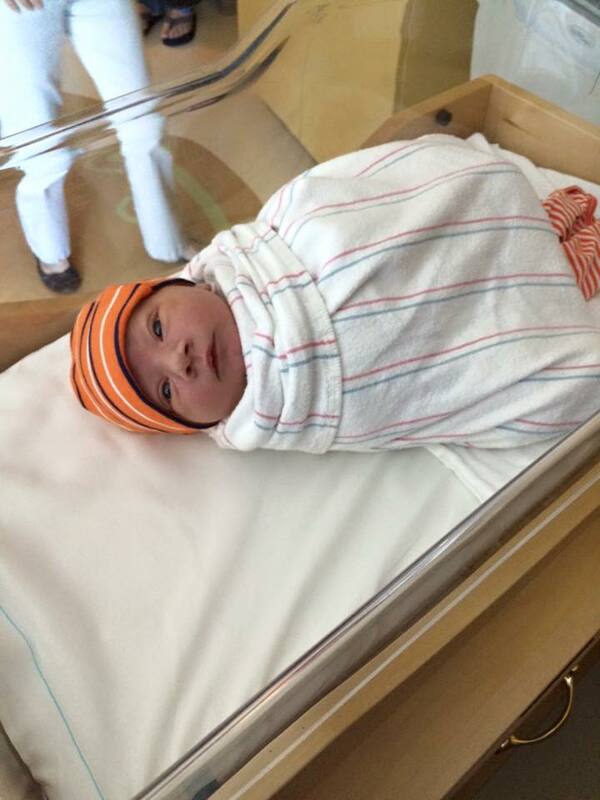 He was born on Oct 21st, 2015 at 6:21 p.m., and thus will remain known as McFly for the rest of his life. But yeah, his due date was Oct. 29th so I didn’t plan much in case he was born then or on Halloween. NEXT YEAR, however, I plan on throwing a Halloween party at my last semester (I’ve decided to do my MA in 1 1/2 years instead of 1 year, I’ll explain later) and the best Halloween costume ever, especially since I’ve been skimping the last couple of years and literally just throwing something together. Luckily, I was able to celebrate Halloween a little early with the kids I babysit with the gingerbread graveyard. 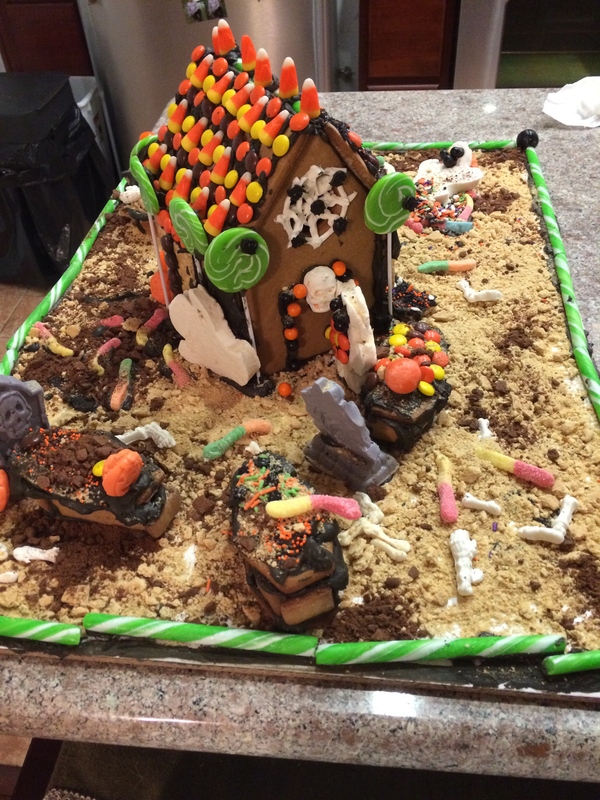 What is the gingerbread graveyard? Three years ago I found a coffin cookie cutter and for a Halloween craft I made little gingerbread coffins for them to decorate. 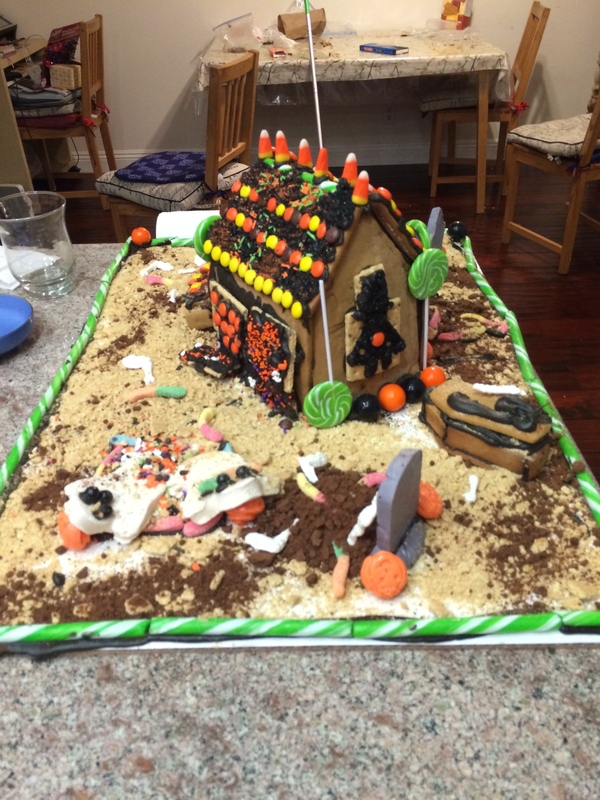 The following year, I got a cake board, grave stone molds, and a lot more candy to make a gingerbread graveyard. THIS year, since I would be 400 miles away at school, we wouldn’t be able to continue the tradition as usual. 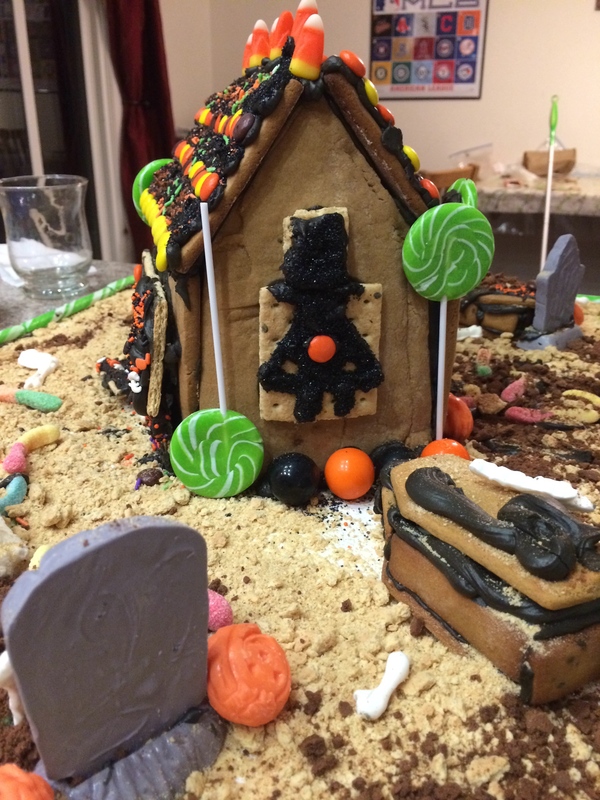 And then we did more than just a gingerbread graveyard, we did a GINGERBREAD HAUNTED HOUSE! Let me tell you how…fun…it was getting Halloween stuff in early August. Thankfully I still have the headstone and skeleton chocolate molds, as well as leftover Halloween sprinkles from last year. Candy corn is available year round, as well as gummy worms, Reese’s pieces, and black licorice. I went to Party City and picked up electric green suckers and candy sticks, and orange and black gum balls. The old dirt is made from ground up graham crackers, while the new dirt is made from ground up chocolate Teddy grahams. Now I don’t have a gingerbread house cutter (which I’m going to buy next time I’m at Michaels, since the Christmas stuff should be out), so I basically eye-balled it when I cut out the house pieces. I filled any gaps with icing and candy. Next time I’ll try to remember the technique of refrigerating the cut cookie dough before baking it to keep it from getting too puffy. I wish I marked down which royal icing recipe I used, but there’s a bunch on the internet, and the good stuff is the stuff with egg whites in it. I also added some cocoa powder to the mix before adding black food coloring to make it look a nice deep black. 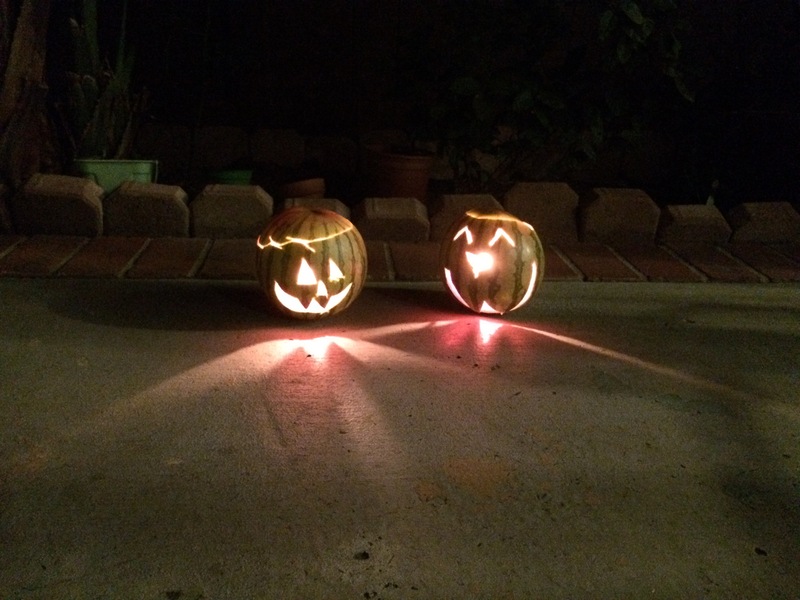 There were two things I needed but were unavailable to me: ghost peeps and candy Jack-o-Lanterns. Since the kids loved these so much, I decided to make my own. The pumpkins are made with Jack-o-lantern chocolate molds, but I was in a bit of a hurry and they didn’t come out as nicely as I wanted. A much bigger hit were the marshmallow ghosts. I used a marshmallow recipe from my Miette cookbook and cut out ghosts with a ghost cookie cutter. Even though they tasted good, they were a bit too floppy, so I’m going to give Alton Brown’s recipe a try to see if it’s a bit firmer. Anyway, I’ll be baking cookies and cake and doing homework today, so I hope all of you have a happy Halloween! There was a really bad article in the LA Times written by a baby boomer that is honest to god titled Millennials, you literally cannot call yourself adults until you take this pledge. It is terrible, the bland comedy is terrible, and it is another drop in the bucket of Baby Boomers shouting down Millennials for trying to navigate in a fucked up economy with rapidly changing technology. 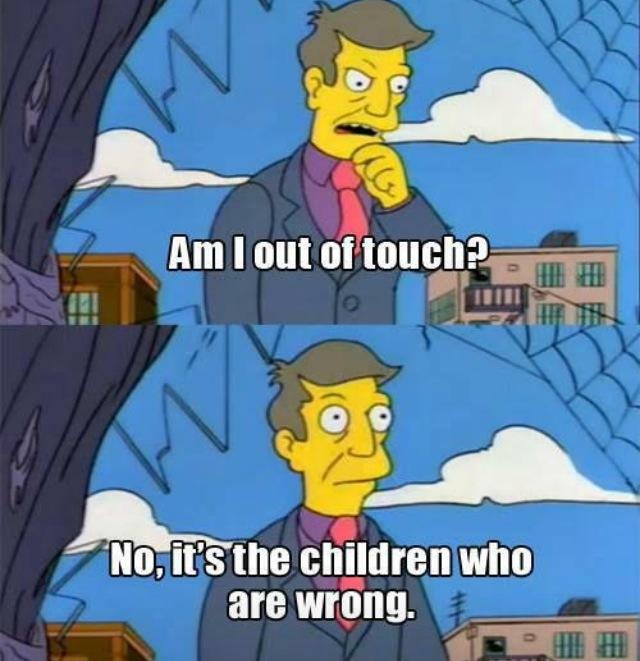 Of course, the older generation shouting down the younger for not doing things exactly as the older generation did, but then there are articles like this that seem to touch a nerve in a bad way. I won’t be shamed for living with family. Living with family is a form of financial responsibility, especially when that BA that your parents and grandparents promised would land you a “good job” right out the gate turns up a job barely (if that, and if you can find one) above minimum wage and you have student loans to pay. I am an adult, with adult fears and adult responsibilities that I am handling the best that I am able. I am entitled to basic human rights such as a livable wage, healthcare, and education. I will not laugh at comedians who are not funny, doubly so if they think “political correctness” is why people don’t think they’re funny. I can laugh and cry at the same time. I will not shame people for preferring text or social media over talking on the phone. I will not assume that an inability to find a job means an inability to find a job that pays $100k. 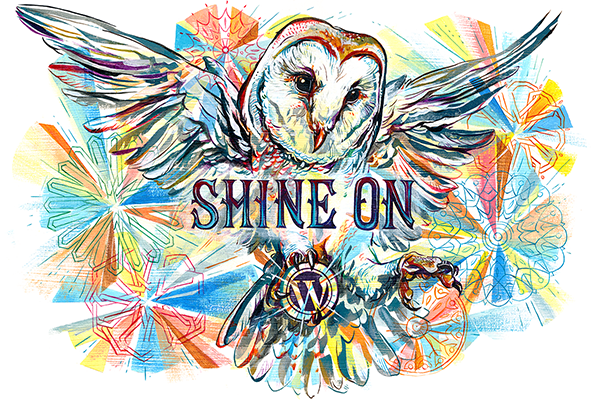 I will not shut up on issues that need addressing, even if certain privileged classes try to sweep it under the rug. 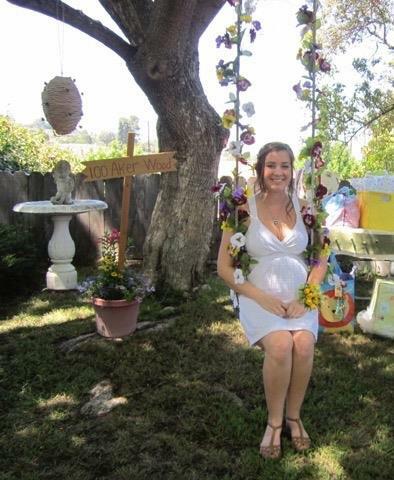 So in the middle of an August heat wave, my mom and I threw a Classic Pooh themed baby shower for my little sister and future nephew. Here’s some pictures from that day!